Thank you for all the lovely feedback on my last post. I’m 16 weeks pregnant now and we’re so excited about our upcoming arrival! We’re planning on moving Everett into his toddler room after Thanksgiving. I am very pleased with how his new room has turned out: bright, cheery and fun. The first item I selected for Everett’s room was this colorful quilt. Once I picked it, the rest of the room quickly came together. I hung this scenic print of a watercolor painting where Everett can see it as he lies in bed. I am so happy with all of the framed prints I ordered from Minted. They really complete Everett’s room and the nursery. I hung this celestial moon print above Everett’s toy storage. Everett recently added the word “moon” to his vocabulary. He always points out the moon when it appears in his story books. I stuffed a few battery operated LED lights into a vintage camping lantern to create a nightlight. It looks a bit like fireflies on a warm summer night. 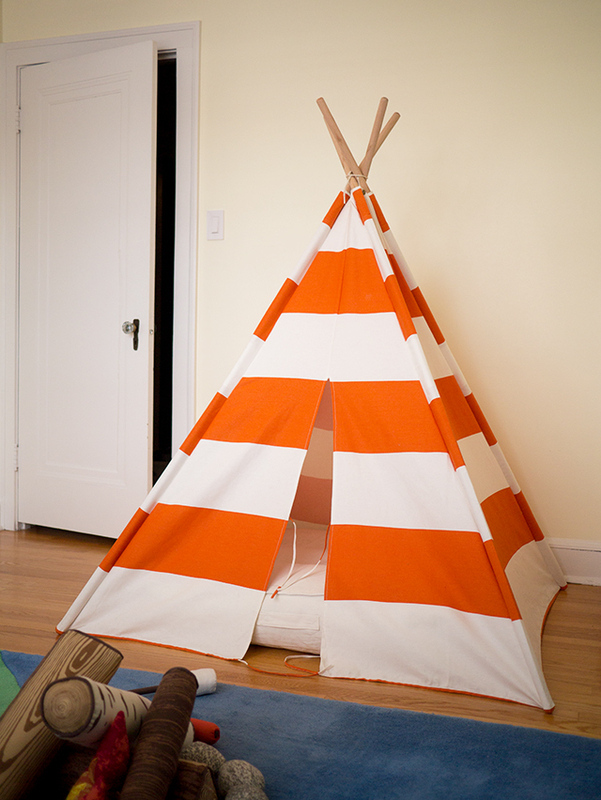 Everett loves playing hide and seek in his new teepee. He tries to sneak-out underneath one of the side walls instead of the front door, then laughs endlessly. In front of the teepee, I added a plush campfire set. Everett’s not quite old enough to comprehend the joy of roasting marshmallows, but he likes throwing the soft rocks around his room. The thick wool rug provides a soft play space for Everett and it should provide a cushion if (or when) he falls off his bed. I am glad I could create this happy space for Everett. It seems to fit his personality and he already enjoys playing in his future bedroom. Hopefully he will settle in long before his younger sibling arrives.